The Jewish quarter of the East end. My secret find here was a section of the original London wall closed in the basement of the Metropolitan University on the corner of Vine and Jury Streets. I'll bring you more after further research of this quarter for you. One of my treasures on this trail. I love the sculpture! It is so simple, but bright and appealing; light hearted! I love this whole focus on the Monopoly board - just stunning idea and creative shots too. Always makes me wanna be home to be in London especially with all the Royal wedding shananigans going on right now - feel very homesick so I love your daily blog images. I look forward to finding out more about your treasure. It is wonderful when you discover something new (or was that old). Lots of London wall around there. I hope you find some. I love this blog and this photo! I found information about Vine street in Westminster, which is claimed to be THE Monopoly one. Which one is correct? The Vine Street in Westminster is the correct one relating to Monopoly. 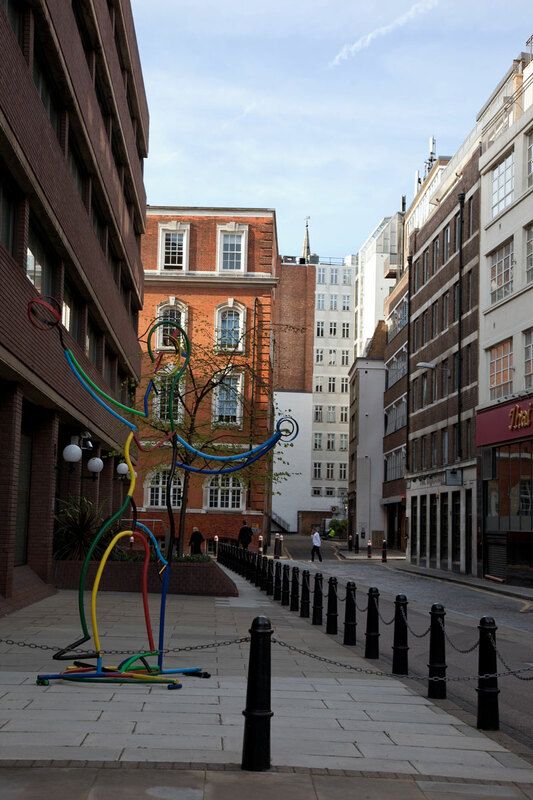 It is just behind the building on Regent Street and links onto Swallow Street.